Tips & Tricks Mini-Site added to our website. We have been inundated with requests for Tuition and Tips & Tricks, as a majority of these requests came from overseas customers, we decided to create a special mini-site which covers Tips & Tricks for Airbrushing. Whether you are a seasoned professional or just starting out, this mini-site will hopefully help you learn new Tips & Tricks. To check out the mini-site, visit our website @ www.airbrushasylum.com.au go to the Nav bar and click on the Tips & Tricks button this will take you directly to the mini-site where you can select Beginner / Advanced or Expert pages and check out Tips & Tricks relevant to that particular section. You can also comment on any posts and feel free to email us @ airbrushasylum@me.com with any suggestion that you may like to see published?. 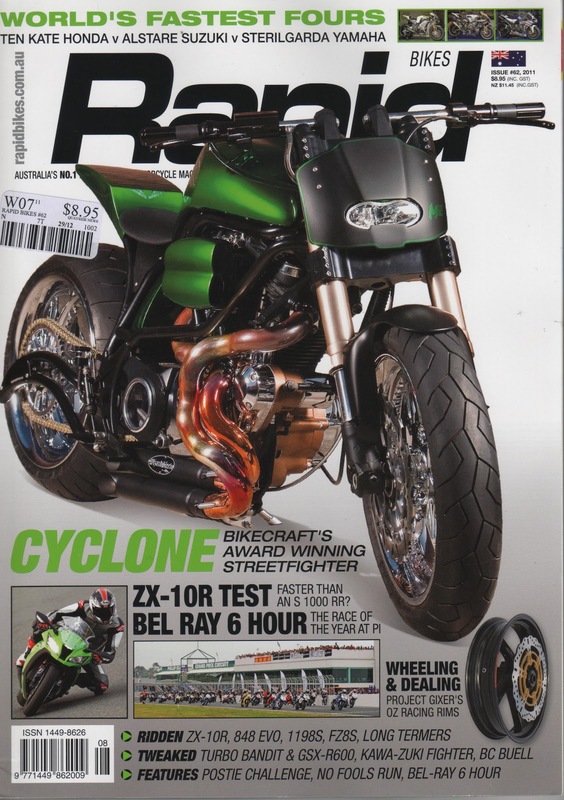 BC Buell gets front cover of RAPID magazine. This bike, built by BC (BikeCraft) has won numerous awards around Australia, and has recently been featured on the front cover of Rapid Bikes Magazine, issue # 62 - 2011. The bike was completely customised by BC and took a reported 2 years to complete. Airbrush Asylum was asked to complete the airbrush rendering of the Celtic Design and adding some BC logos to the mix. The Original design was created by Matt (BC) with the Candy green also applied by BC. Overall it was a team effort and we were really happy to be a part of it. Now known as the ‘Cyclone’ this Buell is a fantastic example of a true custom Streetfighter, and we look forward to working with BC on many more of their unique custom builds. *To see the complete article and pictures of this bike visit our website @ www.airbrushasylum.com.au. ****Photo shoot for this article completed by Jarrod Knight. We were recently commissioned by Harley Heaven : Melbourne, to complete a Tank for Honda’s new bike which they are launching at this years Motorcycle Expo which is held @ Melbourne Convention and Exhibition Centre 26-28th November 2010. Honda wanted to utilise their 1960’s classic winged logo, which we incorporated into the design. Although the bike is a new model, they wanted it to appear ‘old school’...So, with that in mind the decision was made to clear the Tank in Matt Clear. **Visit Us @ www.airbrushasylum.com.au to see the completed bike. This Video shows the process of airbrushing 3 skulls with some piping and skin effects. The entire design was airbrushed freehand and completed on a timber panel, allowing the grain to show through the artwork. Only 3 colours were used to complete the artwork, and its a versatile design which can be altered and tweaked to incorporate it into any application. Feel free to play around with the artwork and put your own twist on it...Have fun and thanks for watching....remember to watch Part 1 so that you can see the beginning of the Artwork. This Video shows the process of airbrushing 3 skulls with some piping and skin effects. The entire design was airbrushed freehand and completed on a timber panel, allowing the grain to show through the artwork. Only 3 colours were used to complete the artwork, and its a versatile design which can be altered and tweaked to incorporate it into any application. Feel free to play around with the artwork and put your own twist on it...Have fun and thanks for watching....remember to watch Part 2 so that you can see the completed Artwork. This short Video shows a variety of custom Motorbikes that we have completed. Both Harley's and Sportsbikes are featured...we hope you enjoy the Video. * To see pictures of more custom motorbikes that we have airbrushed visit us @ www.airbrushasylum.com.au. This video has been sped up to show the process in airbrushing, a basic Koi Fish design onto a Trucker Hat. The design was airbrushed entirely freehand, no marking out and no stencils...As you will see from the video the design was sketched with white, then shaded with a black mix, some steps were repeated to create a little more depth and highlights. We hope you like the look of the finished product as most of our work is automotive it was enjoyable to paint something like this. **Visit us @ www.airbrushasylum.com.au to see pictures of the completed Trucker Hat. This Video shows some footage of this scale mustang warplane taking off, it also contains a step by step slideshow of the Merlin wizard mural which was airbrushed on this plane in early 2008. **Visit Us @ www.airbrushasylum.com.au to see completed pictures of the Merlin plane. This Video showcasing some of the work that Airbrush Asylum has completed over the years. Motorbikes, Planes, Cars, Murals, T-Shirts are some of the artworks featured. This video showcases the SlipKnot bonnet which we airbrushed to enter in the 2006 MotorEx Auto show, judged by US legendary custom painter Jon Kosmoski this bonnet won Best Overall. ** Visit our Cars Gallery @ www.airbrushasylum.com.au to see pictures of the completed SlipKnot Bonnet. This freshly completed Harley Tank will be our permanent exhibit @ Harley Heaven (city). The tank with artwork on one side which is inspired by artist Brian Froud, combined with our signature ‘ selastic skulls’ we wanted to achieve a look that depicts characters trapped inside a tank. The other side shows a trapped skull emerging from the clean white background, complete with rust and peeling paint and an Airbrush Asylum banner. The contrast demonstrates how bright and dark colour schemes can work together. The clearcoat on this tank is the point of difference. The tank is cleared, half gloss and half matt. Basically the white side is to look like fresh paint peeling away and revealing a flat matt paintjob. We are trying to demonstrate that you can still have elaborate artwork even under a Matt clearcoat. **If you want to see the completed tank visit the motorbikes gallery @ www.airbrushasylum.com.au. Airbrush Asylum is excited to launch our new Canvas Art paintings. We are trying to come up with ways to make our artwork affordable to more people, and we hope that these paintings will become as successful as our custom work. This is the first artwork which will begin a new point of sale item for Airbrush Asylum. Each artwork is freehanded on to a piece of A3 Canvas paper. The Artwork is an original design in the theme of our unique style of Artwork. They are NOT prints and once sold the design will never be reproduced, every artwork will be different. Airbrush Asylum is selling these works at a flat rate of $149 AUD, we are prepared to ship the artwork worldwide (postage fees will apply). If you would like to put your name on a list to ensure that you are notified when new paintings are complete, please email us airbrushasylum@me.com and state Canvas Art in the subject line.